Enjoy the convenience of 2 brushes in 1 with Living World Combo Brush. One side features pins, excellent for untangling knots and removing loose hair, while the other side features soft bristles, ensuring a shiny and healthy coat. Regular brushing will help reduce shedding and build a bond between you and your small pet. 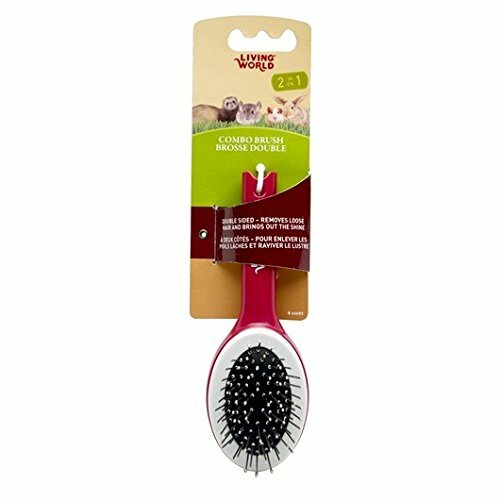 The Living World Combo Brush is ideal for rabbits, guinea pigs, ferrets and chinchillas. Brushing frequency and time should be increased during periods of heavy shedding with special attention paid to classic trouble areas such as behind the ears, on the loins and under the legs. If you have any questions about this product by Living World, contact us by completing and submitting the form below. If you are looking for a specif part number, please include it with your message.